Dr. Bartłomiej Zoń performs comprehensive plastic surgery of the face, breast, and body. He is a specialist in plastic surgery and specialist in general surgery. A member of PTChPRiE. 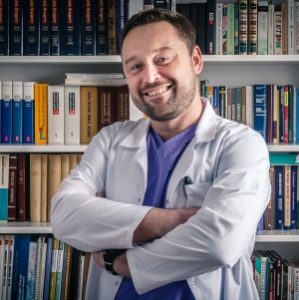 Dr. Bartłomiej Zoń has full, constantly updated medical knowledge supported by many years of professional experience both in clinical and gained in private professional practice. Participant of numerous symposia, training, and workshops in the field of plastic surgery. Dr. Bart Zon realized that he had to continue his medical career combining art, science, mind, and hand. Plastic surgery would allow him to mix and use all his considerable talents. Dr. Zoń, apart from professionalism, represents a maximally individualized approach to each patient, to his expectations and desires.He is 100% prepared and involved in every surgery procedures. Dr. Zon specializes in MINIMAL SCAR Plastic Surgery. They never skip a full medical history to determine indications and contraindications for a given procedure. In each case, it informs the patient about how the convalescence will take place, surrounding him with full post-operative care. He always spends as much time for consultation as the patient needs. The two most critical elements of Dr. Zoń surgical philosophy are selection and perfection. During his training and in the subsequent years, he developed judgment and absorbed techniques from many varied sources. From his observation, there was a sense of excitement about learning the mastery of surgery, especially from those whose skills and willingness to teach was prolific. Surgeons who have minimal selection standards are willing to operate on anyone and everyone. Their results are defined by their work. The surgical plan must be in concert with the goals and desires of his patient, and he must be confident that he will achieve the results intended by the patient. Their goals must be the same. If they are not, Dr. Zoń feels he has failed in his ability to communicate honestly and effectively with respect to his and his patient’s mutual objectives. That is his responsibility.